Oil tank specialist Carbery Plastics Limited is reporting ‘strong demand’ for its all-new 650RB Combi R Bunded Heating Oil Tank. 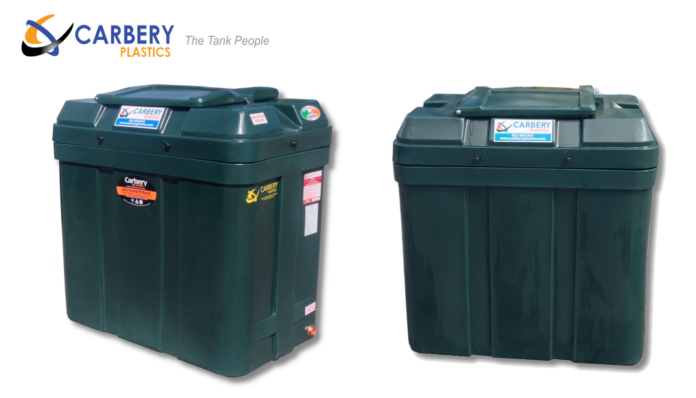 Designed primarily for domestic applications, like every Carbery Bunded Tank, the 650RB has been engineered to exceed the most demanding Irish, UK and European environmental requirements. Approved by experts, the 650RB tank has been independently tested and certified in accordance with EN13341 – a legal requirement for all plastic heating oil tanks on sale in the UK and EU today. Explaining the rationale which underpinned the development of the new tank, Carbery’s Jill Turner says, “With modern gardens getting ever smaller, space at many domestic installation is at a premium. Furthermore, modern, high efficiency condensing boilers use less oil than their standard efficiency predecessors. Today’s heating oil users simply have neither the desire, nor the requirement to store as much oil as before. The new 650RB is now in production at Carbery’s advanced manufacturing facility in Clonakilty, West Cork and available from Carbery stockists and resellers across the Ireland and the UK. Click here to find out more.